The Korat is the silver-blue cat of Thailand which is said to bring good luck. Its name comes from the Korat region in the north eastern plateau of Thailand, where it is believed the cat originated; a place of huge granite outcrops, where the coat would blend with its surroundings. In its native country its name, ‘Si-Sawat’ (pronounced “see-sah-waht”), means greyish-blue. The word ‘sawat’ on its own means prosperity or good luck. Korats are rare, even in their native Thailand, and remain the most highly prized cat of the Thai people; who think of the Korat as their national cat, (not the Siamese, as you might think). Go to Bangkok, to the National Museum. In the Fine Arts Room you may see the Smud Khoi, the Thai book of the Cat. These pictures and poems describe cats of different types and colours dating from the Ayutthaya period of Thai history (1350-1767) and which show that the Thai cats of the 1990’s have changed little if at all in their recorded history of more than 600 years. Wichianmaad, the Siamese? Thong Daeng, the Thai copper? The Dorklao is the ancient Thai name for the Korat which is the small, silvery cat with eyes too big for its face and a nature too loving to resist. To us the Korat is special. The heart-shaped face, the wonderful luminous eyes of intense green, the neat, compact, firm and elegant body all combine with its loving, playful and loyal nature to make this cat of Siam the only cat for us. 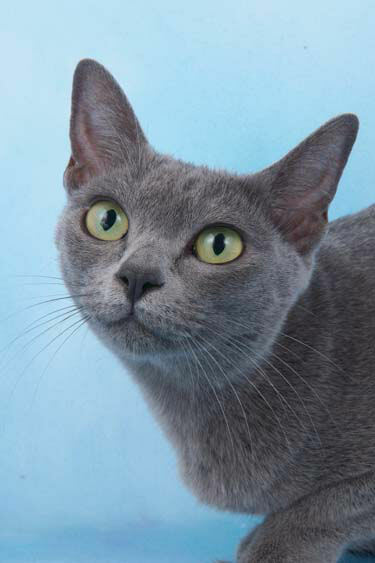 The modem Thai name for the Korat is Si-Sawat meaning greyish blue. The name Korat was given by King Rama V of Siam (1868-1910) who is thought to have asked where the cat came from and been told from Korat province in northern Thailand. This is a land of huge granite outcrops and it is said that the Korat’s colour helped it to blend in with the rock, and thus camouflage it from danger. There are many myths and charming stories about Korats. Some, one hopes, are true. All enhance the mystique of these beautiful, independent cats. The Korat is the ‘good luck cat of Thailand’ still associated with ceremonies to bring vital rain to the rice crop. The cat is paraded round villages in the north east of the country and sprinkled with water to ensure the paddies are filled with water. Korats are also used as watchdogs because they give warning of intruders by growling at the sound of unfamiliar footsteps. A Korat was a traditional gift at a Thai wedding, because of the good luck they would bring to the newly married couple. At this time Korats were never for sale, they were only ever presented as gifts. They are still rare, even in their native country, and remain the most highly prized cat of the Thai people. The first Korats in the west were imported into the US in 1959, having been given by a breeder in Bangkok. They were owned by Jean Johnson of the Cedar Glen line, and thus began the history of the Korat in the west. Their names were NARA and DARRA. At this point it is worth explaining how things were done in Thailand. The Thais allowed Siamese, Copper and Korats to interbreed. They named the offspring according to colour, so it would be perfectly possible to have Siamese, Copper and Korats all in one litter. Nara and Darra were also mated to Thai imported Siamese in the U.S, but kittens other than blue were not registered or described as Korat, to preserve the image of the Korat as purely blue. Any one individual may be blue in appearance, but may carry the genes to produce Siamese or lilac. It can be many generations before these genes reappear. So it has been with the Korat. In the US in 1965 the Korat Cat Fanciers Association was formed by a group of owners and breeders, with the objective of the development and protection of the Korat cat and to produce a standard of points. The Korat was first accepted for Championship status in 1966. The first Korats to be imported into the UK arrived in quarantine in March 1972. Their names were BRANDYWOOD SAENG DUAN, SAMELKO SAHM and SAANG JAHN’S TEE RAHK. Saeng Duan gave birth to 5 kittens on Easter Sunday 1972. The other two were both male kittens. By 1974 there were more than 20 Korats in the UK. It took another 10 years before the breed gained Championship status from GCCF. Today the Korat is a minority breed. They are neither wild nor flamboyant, medium sized, and without freak appeal. However, many owners testify to the joys of being owned by their Korat, and realise nothing else is quite the same. They appeal to those who appreciate subtle quality. The Korat is a slow maturing, medium sized cat with smooth curves and a heart-shaped face, with large luminous green eyes. The body is semi-cobby muscular and firm, with a blue coat well tipped with silver. The Korat can be a very vocal cat, but this does not usually indicate aggression. The Korat of today is just like its ancestors in ancient Thailand, in fact the breed is one of the least altered by modern breeding. In temperament the cat is very ‘person oriented’, which means they like to be involved in their owner’s activities. A typical Korat will be seen with its nose in the hole you are digging (such a help), many love to travel in cars and some insist on going everywhere with their humans! Generally speaking the breed is of a gentle disposition, enjoys company, and is intelligent. Some play games like ‘retrieve’. They are very affectionate and normally fit into most households without problems. A) THE HEAD The Korat should have a heart- shaped head and face when viewed from the front. The forehead should be large and flat. Too narrow a head is not desirable. B) THE NOSE The nose has a downward curve just above the nose leather and the required stop should be easily seen in profile. C) CHIN AND JAW Chin and jaw should be strong and well developed, completing the heart-shaped head. D) EARS Although large and set high, the ears should not be too upright. E) EYES The eyes size and prominence is a particular feature of the breed. The eyes should be bright and almost over large, with a green luminosity as though lit from within. F) BODY This is a cat that is lightweight in appearance, but unexpectedly heavy when picked up. The body should be supple and well muscled with the feeling of hidden power. G) TAIL The tail should be of a length that is in proportion to the body, neither long and whippy nor too short. H) COAT The coat should be short to medium in length, glossy and close-lying is the ideal. I) COLOUR The coat colour should be very well tipped with silver. It is the tipping that is of primary importance. The coat should be free from patchiness or tabby markings. The lightness or darkness of the colour can vary. It is the graduation from root to tip that produces the required silvery sheen. This is a well proportioned cat without the extremes seen in some breeds and still true to its origins in Thailand. They are a delight to own, loyal and loving yet independent and full of character. Just as British cats were originally described according to their colours, so it was in Thailand. The name Korat is only ever given to the blue cat, and this tradition has continued in the west. However, once it became clear that recessive colour genes had been inherited from their native country, we had to accept that Korats could produce both blue point and lilac kittens, although both colours are rare. Britain is the only country, at present, which acknowledges these variants. They have been given the names of Thai Blue Point and Thai Lilac. This is done to establish them separate from the Korat. They are registered on the Experimental Register and have been shown in their own Assessment classes since 2002. Their popularity with breeders and new owners has meant that from June 2009 the Thais have been awarded Provisional Status and we hope their popularity continues and that Championship Status is not too far away. Because of what we know of the breed’s origins and background it is extremely unlikely that there will ever be any other colours. A strict Registration Policy prevents the progeny of any out crossing being registered as Korat. In looks the Korat remains exactly as it was described over six hundred years ago. It is truly AN ANCIENT NATURAL BREED. Many Korats are seen at shows. GCCF (through the Korat Breed Advisory Committee) has approved judges who are trained to know the breed, and it also provides guidelines to judges, to try and ensure the Standard is maintained. There are club prizes for those cats and kittens that do best during the show year, and also a competition for the best pet, annually. K&TCA has its own Championship show held each year in October.